When tank is in reserve mode or empty it automatically starts the motors if water is present in the Sump tank. If water is present in the line it indicates the presence on the unit (Flow Indicator). It indicates water levels reaching in tank, which is helpful if there are open taps, blockage, leakage or damage in the pipeline connected to the upper head, ground or the desired storage tank. It green colored 2 level indications (half tank & full tank) of water in tank as well as 2 level indications (foot valve level & half tank) of sump tank. On motor symbol green colored indication for motor ON & red colored indication for dry run of motor. Has rocker switch to select Auto/manual operation. Has soft touch ‘NEED’ button to switch ON the motor irrespective of any level in the overhead tank. 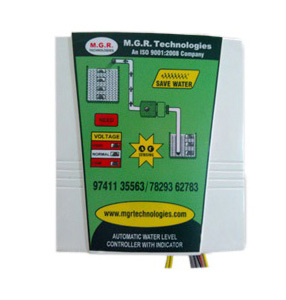 The Automatic water level controllers offered by us are suitable for single and three phase motor. These are also used in suction, multi tanks and delivery tanks. The sensors are fabricated from high grade stainless steel that makes them corrosion resistant. In addition to this it has the provision to switch pump On and Off automatically as per time of the day as well. Its Serves 24 hour water suuply to without letting the over head tank to become dry. It Can be fixed for Sump,Borewell,Open Wells Drainage, All types of motor like single phase, Submersible,compressors etc. LIAMOCON: It takes the responsibilities of a man who switching On/Off the motor. Its serves 24 water supply to you without letting the over head tank to become dry. The water in overhead tank falls to prefixed low level i.e., below 75%,50%25% as adjusted. The sump is full irrespective of any levels in the over head tank at once when power comes. Soft touch NEED in case to Switch on the motor in any irrespective of any level in the over head tank. The switch is in mannual position. Liquid reaches maximum level in the over head tank. There is a low or high voltage. Liquid in the sump goes below foot valve or as prefixed low level. Liquid does not flowing to the over head tank. Show clear indication of water levels in the over head tank and sump tank. Shows voltage variation if any in the left bottom corner, it shoows green indicator for normal voltage, Higher red light indicates high voltage and lower red lifht indicates low voltage. Has an easy operatable AUTO MANUAL feather switch. Green indicates AUTO Mode, Orange indicates dry running of motor. Soft touch 'NEED' in case to switch on the motor irrespective of any level in the overhead tank. Soft touch 'SILENCE' for silencing alaram. Blinking green light indicates liquid flow to overhead tank. Red indication with beeping sound for over flowing of water from over head tank. 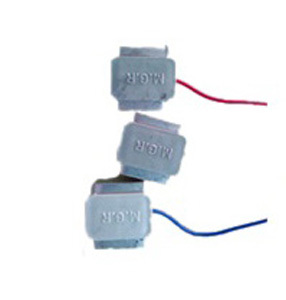 Side leap switch enables to power on ond off Direct on for motor. 1. When there is an voltage fluctuation. 2. When the motor is dry running due to footvalve blockage or priming fault in motor. It can be fixed for single pase motor, Single phase Submersibles, Three phase motors. (For three phase and Single- phase Submersible Starter is necessary) and open well, Borewell, Sump. We can control two motor & two sumps & two over head tanks by single unit (Auto Change Over). Many models available different range.